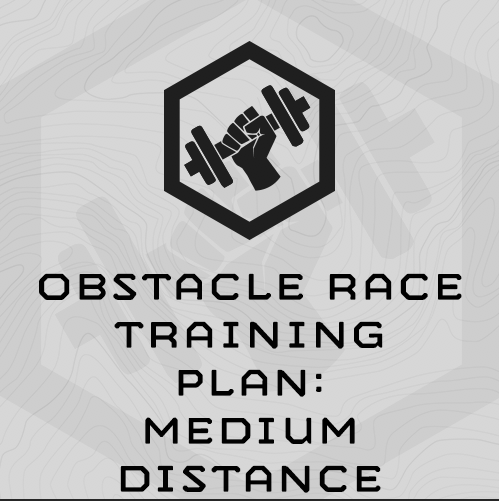 This is a 7-week, limited equipment, total body event specific training program to train for the demands of the medium distance obstacle races, 12-14 miles in length, with up to 35 obstacles. While the length of these courses has a high endurance demand, the obstacles require the competitor to have the strength and work capacity to crawl, jump, climb, and carry objects over varying terrain. This plan concurrently trains strength, work capacity, chassis integrity and endurance to successfully compete in these events. Complete this training plan the 7 weeks directly before your event. Week 7 is an unload/taper week – so no extra rest is necessary. For unloaded running, the plan trains both speed over ground via a 6-mile assessment, and follow on 2-mile intervals, as well as aerobic base long, slow runs out to 9 miles. The total running volume in a training week is at or slightly above the race distance. Parts of this training program are assessment based. It deploys bodyweight calisthenics and running assessments the first and fourth weeks. Follow-on progressions are based upon the athlete’s assessment results. You’ll train five days a week for seven weeks, with a total of 35 training sessions. You’ll train Monday through Friday and take weekends off. 50-60 minutes for the gym-based sessions. Endurance (running) sessions may extend past 90 minutes. (5) Run 6 Miles for Time.
" Just ran the Spartan Beast this morning, finished in 3:29 which was good for a top 100 finish on what is probably a faster/flatter course (Chicago). Quads feel great thanks to the complexes and my grip did great other than slipping on a couple obstacles due to weather (rained entire time!). Thank you again! Great stuff and am looking forward to starting a new program."